This course has been designed for non-profit community groups or for-profit companies, with specific emphasis on those skills required to strengthen media relations performance. It is particularly helpful for those individuals or groups, which want to create stronger links with print and broadcast media and highlight in a more effective manner the services they offer and the successes they have enjoyed. 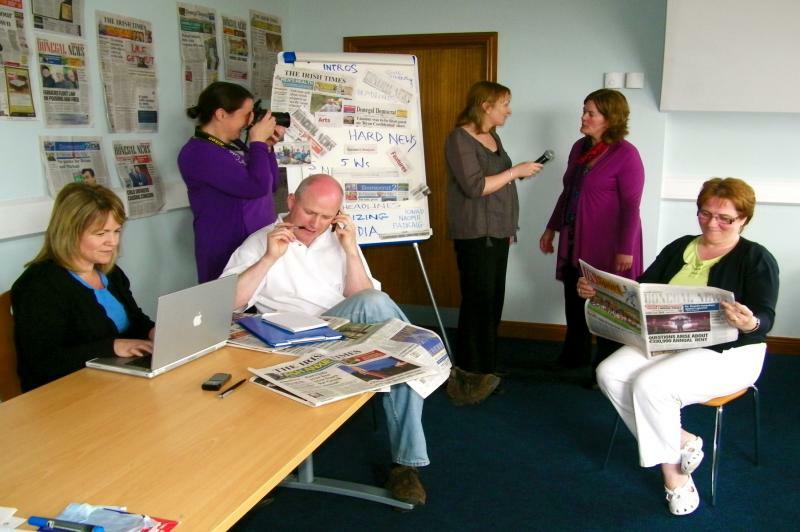 Community leaders become news gatherers in a simulated role-playing exercise – a key element of the ‘Mesmerizing Media’ course at Ionad Naomh Padraig in Dore. • Prepare short and long-term media campaigns. For example, find below elements of a specific coaching course. Variations on this course can be organised for your community group, professional association, business or bank staff. Time-frames can vary with FIOS able to provide evening, full-day and weekend courses, dependent on budget and time flexibility of your organization. Clarifying the importance of strong media relations. Assessing the existing media skill level and needs of participants. Insights into the nature, modus operandi and the common terminology used in print and electronic media; and how news and feature stories and program ideas are generated. Clarifying the importance of working with the media and its benefits for each participant and their sphere of operation – with illustrative examples of specific benefits derived from effective media campaigns in community/business development and awareness programs. Understanding importance of knowing what your target media is, their specific deadlines and how to meet them. Guidance on creating a strong database of journalists, editors, program producers and other key media contacts. Basic rules for NGO/business leaders in organizing and shaping the information they want to be communicated according to message importance and media priorities. Practical exercises in design, writing and editing press releases and effective way of distributing them for maximum benefit. Photos – the importance of visuals for the media and how to provide them to reinforce press releases and attract greater media coverage. Advance preparation for such interviews. Practical interview exercises. Specific and personal critique of each interview. Recap of main guidelines and skills discussed on course.